So… yeah, I’ve got bedbugs. All those times hearing the rhyme, Sleep tight. Don’t let the bedbugs bite! and I thought it was just a cute thing to say at bedtime. Yeah… not. Even though this is just the latest in a string of FML occurrences that have been going on since September, I’m currently at a “good place” with the bugs. Nature built them well, no doubt, but I haven’t been going crazy either giving up and trying to live with them or insanely and aggressively trying get rid of them with consumer-available products. I’m doing what I can, blocking their avenues of access and occasionally laying myself out as bait* to see whether or not they’re still around. Gross as it may be–and I apologize if anyone’s got entomophobia–the photo above is part of my “proof” for the pest control professional who made a visit today, since one of the first things they ask is either, “are you sure?” or “have you been bitten?” It’s also a tiny bit satisfying to have a small graveyard of the little buggers, but everything I’ve read & researched indicates that it’s just impossible to get rid of even a small infestation on your own without resorting to extreme and often unsafe measures. Honestly though, the worst thing through all of this has been the inability to feel comfortable in my new place. Even though the move wasn’t my choice, and I wasn’t able to find a new place in the area that I love, I am in a very nice–luxury, even–apartment in an amazing building and in what will be** a lovely neighborhood. But as my primary concerns have been getting a full night’s sleep instead of unpacking and decorating, my place is hardly ready for anyone other than the most understanding of friends. And I’m hesitant to have anyone–be it friends, or guests of a more temporary nature–come over when I may inadvertently send them home with a hitchhiking insect. So I had an inspection from the complex’s contracted pest control company*** today, they confirmed the insects and I’ll hear back from them on an appointment to treat the apartment. On my way out, I spoke with some of the apartment complex staff and I was definitely feeling a little bit of dickery. I was being talked down to just a bit, and not made to feel that even though this is a problem, it’s not my fault. So we’ll see how I’m treated once things get going. Hopefully if everything goes smoothly, I won’t have to write about this again unless it’s a post in the future praising restful nights, new furniture and a housewarming party with plenty of cocktails! * At my most frustrated, I was sleeping in long PJ pants and long-sleeved tee. This did not deter them in the least. While they didn’t try to feed on my face, they’d just crawl in the neck hole and back out. Unfortunately, this course of action left more of them squished dead inside my shirt when I moved around. Thankfully it was a red shirt. ** Don’t believe any hype people may tell you about “The Front“. This place has a lot of potential, but it needs a LOT of work and the local BID just ain’t cutting the mustard so far. 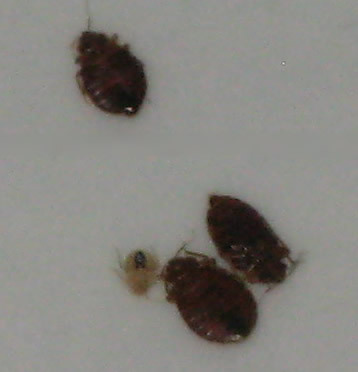 *** Apparently DC Health Law says that the landlord must deal with a tenant’s bed bug problem. A bit of a pain, since I’d already called another company. It was that company that told me to get in touch with the complex first. @lacochran: Uh, yeah… there’s no danger of that, I think. Oy. What a pain in the @$$. Good luck with the eradication! And dealing with patronizing dicks. They’re almost worse than the bed bugs, aren’t they? People think bed bugs = dirty people and oh are they wrong. Ignorance is bliss sometimes. Best of luck! Oh gross– poor you! Clearly, you need alcohol. .-= latest entry: 4 ~ The Emperor =-.